It seems that we're having a giveaway each week and I am hoping that you all like it and enjoying all these so far. 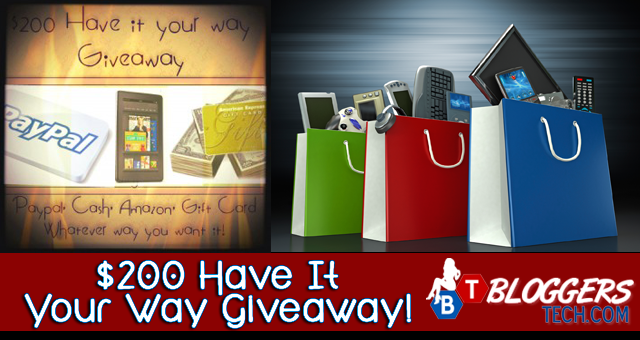 Obviously today we have another giveaway and this is quite unique actually because you can say what you want to win as long as it's worth $200 and below. What Can You Have for $200? I've been fond of browsing Amazon lately and because I'm living away from the US and it's obviously much cheaper and more choices over there compared here. Because of that, I tell you you can totally have lots of items you can have with your $200 including the shipping fee. I bought few weeks ago a Sony Bloggie for $69 and a Logitech webcam for $49 both in HD which is really great. I'll be posting reviews about these items too soon here in Bloggers Tech blog and be sure to tune in for it! Obviously, I'm a techie stuff and I want to have these electronic items but because of distance and the expenses of having it sent here. All I can do is droll and dream of having it. Lucky you, if you'll be able to win this giveaway you can buy items you want to have where item and shipping is included in $200. So if your item is $200 and the shipping fee is $10, you'll be paying the shipping fee. So anyway, let's go ahead and win this giveaway shall we?